Cigarette, beware what it contains! Register as a member | Forgot Password? Diabetes is a medical condition in which the blood glucose levels remain persistently higher than normal. This results from defects in insulin production, insulin action or both. It is becoming more common in Singapore. This may be due in part to our ageing population, unhealthy diets and a lack of exercise. Diabetes can lead to serious complications like kidney failure, blindness and stroke, but people with diabetes can take steps to control the disease and lower the risk of complications. About 9% of the adult population in Singapore have diabetes. Diabetes can affect people of any age or race. However, 90% of people with diabetes are over 40 years old. Insulin is a hormone produced by the pancreas. This hormone is necessary for the body to be able to use glucose for energy. Glucose is the basic fuel for the cells in the body. When you eat food, the body breaks down all of the sugars and starches into glucose, before it is absorbed into the bloodstream. Insulin takes the sugar from the blood into the cells to be used as energy. Type 1 diabetes is usually diagnosed in children and young adults. However it can also occur in older adults. In type 1 diabetes, the body does not produce insulin. Hence insulin is needed for treatment. Type 2 diabetes occurs more frequently in people over 40 years old, particularly those who are overweight and physically inactive. However, more young adults and children are developing type 2 diabetes. 80% of all persons with diabetes belong to this group. In type 2 diabetes, either the body does not produce enough insulin, or insulin becomes ineffective (insulin resistance). It can be controlled with proper diet and exercise. However, most type 2 diabetics also need oral medication and/or insulin to control their blood sugar levels. Gestational diabetes is a form of diabetes that occurs only during pregnancy. It usually develops between the 24th and 28th week of pregnancy and affects about 4% of all pregnancies. If you fall into any of these categories, you should be screened early, within the first trimester, for gestational diabetes. Once you are diagnosed, it is important to take action quickly. Your obstetrician will refer you for education and often your initial appointments will be with a nurse and a dietician. You will be asked to make some lifestyle changes in order to manage this condition successfully. The immediate treatment for gestational diabetes is a meal plan for diabetes tailored for pregnancy, which will provide adequate nutrition for your baby and control your blood glucose levels. The meal plan will modify carbohydrate ingestion with special attention to portion sizes and the spacing of meals and snacks. You also will be asked to check your blood glucose levels four times each day: before breakfast and one hour after the start of each meal. Additionally, a low-intensity physical activity, such as walking, will be encouraged, if possible, to help lower your blood glucose levels and to avoid excessive weight gain. With careful diabetes management, women can and do have successful pregnancies and healthy babies. After you've delivered your baby, it is important to be vigilant about eating right and staying active. Women who have had gestational diabetes have a 50% risk of developing type-2 diabetes in 7 to 10 years after the birth of the child. After delivery, women who have had gestational diabetes and are overweight should aim to lose 7% of their pre-pregnancy weight, which will reduce their risk of getting type-2 diabetes by 60%. 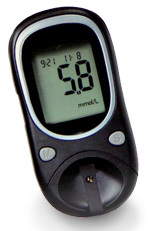 Click here to see full range of diabetes diagnostic aids.